Pittsburgh guard Ramon Foster is asking his ex-teammates to stop the criticism of current Steelers players. The latest social-media salvo was fired early Thursday morning by former Steelers running back Rashard Mendenhall, who called quarterback Ben Roethlisberger a racist in a series of tweets. Mendenhall, who played for Pittsburgh from 2008-12, was addressing accusations that wideout Antonio Brown quit on the team when he did not play in the 2018 season finale. Steelers vs. Saints live stream: Watch NFL Week 16 game online originally appeared on nbcsportsboston.com The Pittsburgh Steelers beat the New England Patriots last week at Heinz Field, and it&apos;s very possible they will determine who the Pats play in the Wild Card round of the AFC playoffs. The Steelers entered Week 16 atop the AFC North at 8-5-1, but after the Baltimore Ravens beat the Los Angeles Chargers on Saturday night, Pittsburgh needs to beat the New Orleans Saints on the road Sunday to remain in first place in their division. A Steelers win over the Saints would keep the Ravens in the No. Green Bay Packers @ Chicago Bears The NFL&apos;s longest winless streak on the road belongs to the Green Bay Packers, who have gone eight games without tasting victory on their travels. Packers running back Aaron Jones needs 280 yards in his team&apos;s final three games to become Green Bay&apos;s first 1,000-yard rusher since Eddie Lacy managed the feat four years ago. Dallas Cowboys @ Indianapolis Colts Indianapolis are seeking a fifth home win in a row for the first time since they won seven on the spin between October 2012 and September 2013. As the high-profile holdout of Steelers running back Le&apos;Veon Bell continues, more reports are surfacing about past Pittsburgh offers that the two-time All-Pro has apparently turned down. 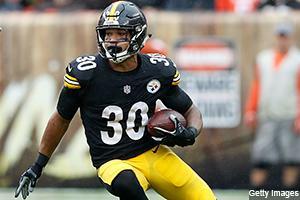 The three-time 1,000-yard rusher nixed an offer from the Steelers with the team pledging $47 million to Bell over three years, Pro Football Talk reported Friday. An NFL source told PFT that the package had the potential to guarantee Bell $20 million -- a $10 million signing bonus plus another $10 million bonus soon after the agreement. Pittsburgh Steelers wide receiver Antonio Brown said Thursday that his frustration on the sideline during Sunday&apos;s game and his tweet toward a critic on Monday came from his desire to win. Meeting with reporters for the first time since the team&apos;s 42-37 loss to the Kansas City Chiefs, Brown made it clear he does not want a trade, but rather for his team to start performing at the level it has previously. "We were losing the game... we haven&apos;t won a game yet," Brown said. 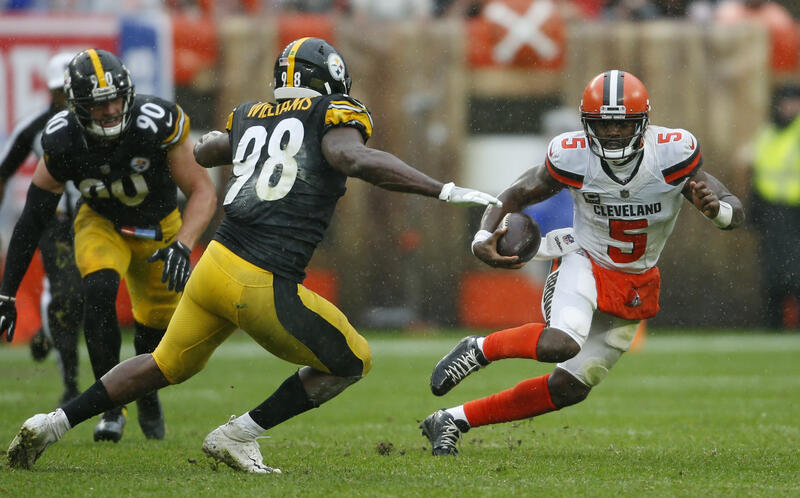 The Browns rallied from a 14-point deficit in the fourth quarter against the rival Steelers and snapped a 17-game losing streak with a 21-21 result that left fans celebrating in the rain. For a while, it seemed the Steelers would cruise to another easy win over the Browns even without Le&apos;Veon Bell. Backup James Conner had 135 yards rushing and two touchdowns and caught five passes for 57 yards.